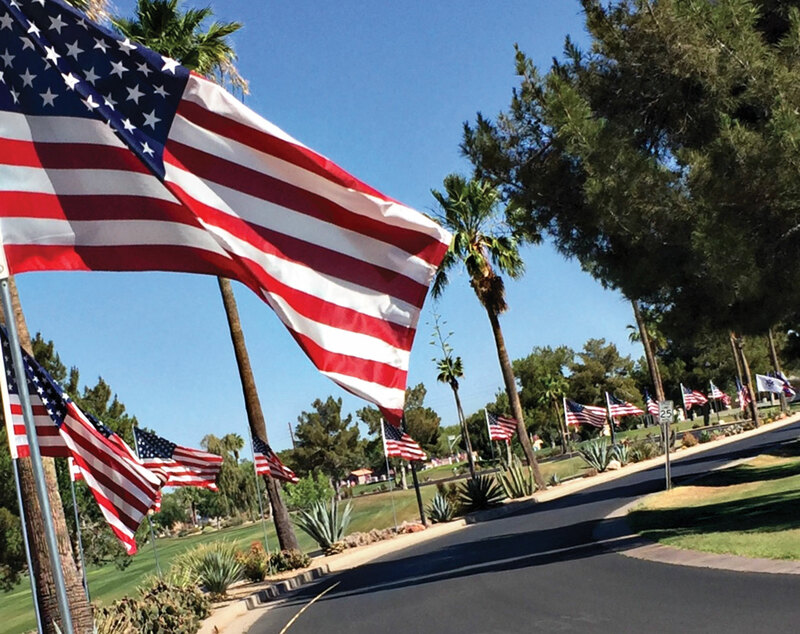 Amid the parades and fireworks on July 4th, 538 SunBird residents will fly flags in their front yards, reflecting deep appreciation and support for our military that protects us and our freedoms. Freedom isn’t free. The flags began flying on Memorial Day, remembering the many who sacrificed their lives and health, and whose families were forever changed. The flags will continue flying through December 7, Pearl Harbor Day. Making these flags fly takes a team of people: Fred Garmeson, Carol Zittel, the SunBird Lions Club and residents who donate $35 a year to have a flag placed on their front lawns. Another 40 flags fly at Springfield and ten are at A-1 Golf Carts. The flags also fly on Labor Day, Patriots Day on September 11, Veterans Day, Pearl Harbor Day on December 11 and Flag Day in June. Fred has dug the holes and placed the holders for each flag, and sets up 13 delivery routes. Carol and helpers deliver them in golf bags by truck. 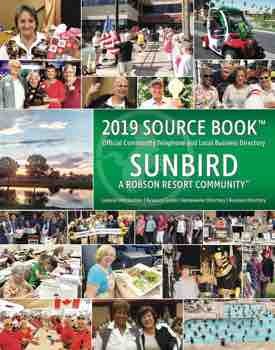 Some members of the SunBird Lions are veterans besides Fred, including Pat Scott, Ray Clark, Ken Haefner and Gayle Holland. Carol’s deceased husband, Fred, was one of the initial organizers. Other veterans at SunBird include Paul Oliver, Jeff Carlson and Al Sjurseth. A sign with the names of our veterans who called the office, and their branch of service, was displayed at the golf tournament, and a memorial is planned later. The Lions Club donates proceeds from this program to the “Soldiers’ Best Friend,” which trains dogs from shelters to be a companion for veterans who have PTSD. Some other programs include helping for natural disorders, measles vaccinations, leader dog school for companions who are blind, a foundation for blind and hearing disabilities, groceries for kids at Christmas and a camp for the disabled. Chuck Warren, who just returned from an exciting Honor Flight to Washington, D.C., will talk about his trip in our November issue, where we will recognize the 100th anniversary of Veterans Day. Other SunBird veterans are invited to be included by sending their names, branch of service, war and short remembrance to Jackie.Cox1943@gmail.com by November 5. Fighting alongside our United States soldiers were many Canadian soldiers, many of whom are SunBird winter residents. Last year Canada celebrated its 159th year of independence on July 1.